Salvador and Lauren exploring the world of beer microbes at Kathinka Labs. The Panamanian craft beer scene has exploded in recent years as consumers begin to acquire a taste for beers outside the typical pale ale lager box. Craft and microbreweries have popped up all over the country, brewing a wide variety of beers that any craft beer lover will enjoy drinking in the hot and humid climate of this beautiful Central American country. At the beginning of the month I had the opportunity to sit down with Salvador Villacreces, the Headbrewer at Cervecería Clandestina, a popular craft brewery in Panama City. Originally from Granada, Spain, Salvador has now found himself has headbrewer of one of the largest craft breweries in Panama. Salvador made the trip north to Colorado to visit Kathinka Labs, where Clandestina often sends samples for testing. Salvador also had a chance to experience the vibrant Colorado craft beer scene that we are so well known for, finding inspiration from some of the best brewers (big and small!) in the Americas. How did you get into brewing? I wanted to get into food engineering and then I learned more about brewing and headed in that direction with my career. How did you end up in Panama? I was working at a brewery in Spain – the second brewery I had ever worked at – and I found the position. I studied the position and decided to move to Panama because it was such a nice project to get involved with, a project that would allow me to brew my own beer. What is the biggest challenge right now facing the brewing industry in Central America? We have really difficult conditions. The weather, for example, is not so good for the beer. Panama is 30 degrees Celsius (86 °F) all year and has almost 90% humidity – a good environment for bacteria. We just need to take more care in sanitation and cleaning equipment. We have sometimes difficult conditions for receiving the raw materials because we don’t produce malt or hops, or even yeast. It’s a really good area for the consumer – consumption is really high, but not great for production. So I think we need to support everything and we need to fight versus the climate and weather. How big is Clandestina? Actually, I believe we are the biggest craft brewery in Panama. We have 3 tanks with a capacity of 30 hectoliter (brewhouse built by BrauKon). We brew about 150-180 hectoliters per month. Do you bottle and can your beers? No, just bottle. We also have a taproom that is used when we give tours, which are usually only on the weekends. Every Saturday we usually have tours. So, people in Panama are really interested in craft beer? The movement is growing really really fast. Every week you find a new place that you can buy craft beer. You will see day-by-day places you can buy craft beer on the streets. What excited you the most about the future of craft beer in Panama? The market will grow a little more and day-by-day the beers become better. Next year we will have a competition for international beer. Also, Kathinka will be moving to Panama, which will help greatly with quality control. What is your favorite beer at Clandestina? Xa’madre IPA (American Style IPA) – we use a hop that is really really fruity and really citrusy – it’s a really special beer for me. What does “Xa’madre” mean? This is like a slang. It is an expression you use in Panama to say a lot of different things – a surprise expression, something really good or bad. But we use it in a good way! What is your customers favorite beer? People love our German Pilsner – the Nómada. I think like half of our production is this pilsner. Because Panama is so hot it’s a really drinkable beer. So what brought you to Colorado? We work with Floris so we wanted to visit him and the lab and also see all the breweries here in Colorado. It’s vacation plus work! What has inspired you the most about the breweries in Colorado? It’s a difficult question because all of them are really good. We went to Funkwerks yesterday and it was amazing. I had one of the best Saison I have ever tried. A really nice brewery. Of course New Belgium was very inspiring as well but you expect the beer to be really good, and it was. Funkwerks is not very well known and very small but the beer was incredible! Do you have a lab at your brewery? A small one. We are only a year old brewery so it is small but we want to grow it to improve our quality control. We are learning a lot here from Kathinka and will take this knowledge back to our lab and brewery. 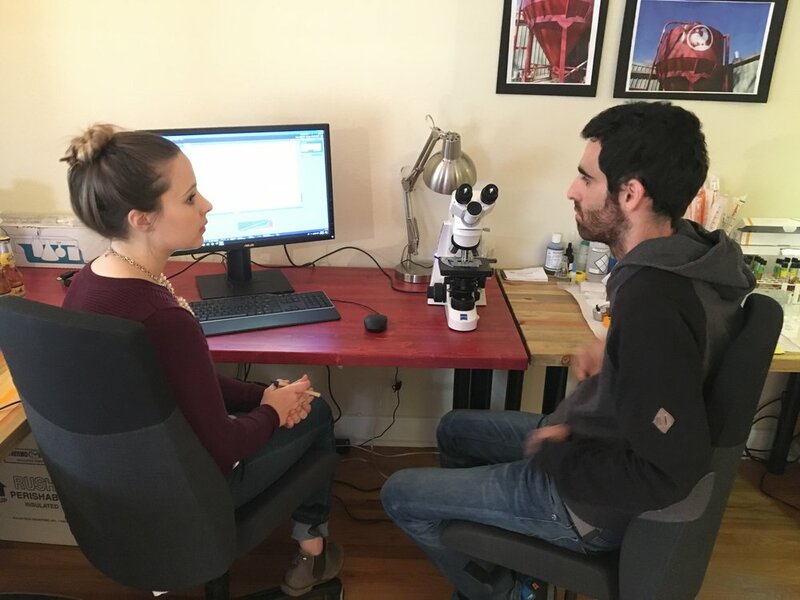 After our interview Salvador finished with his training at Kathinka Labs, where he completed the “Best Practices for Analytical and Microbiological Analysis of Craft Beer” course taught by Lauren Sandell, Kathinka’s Lab Manager. It will be exciting to see Clandestina, and the Panama craft beer market as a whole, grow and improve in the years to come. Stay tuned for more news from our Panamanian friends and salud!